Erica Bunker | DIY Style! 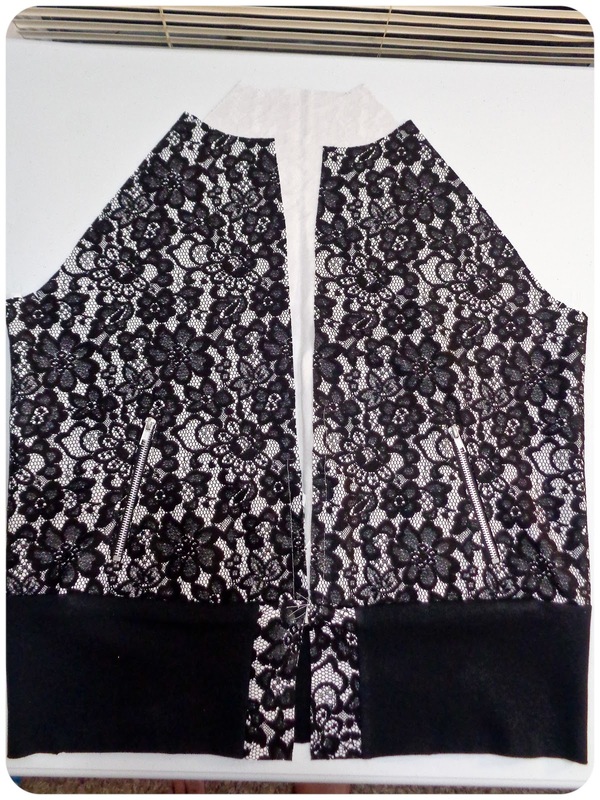 The Art of Cultivating a Stylish Wardrobe: Style Maker Fabrics Fall Tour - A Bomb(er) Lace and a Suede Skirt for Fall! Style Maker Fabrics Fall Tour - A Bomb(er) Lace and a Suede Skirt for Fall! I am collaborating with Style Maker Fabrics for their Fall Tour. 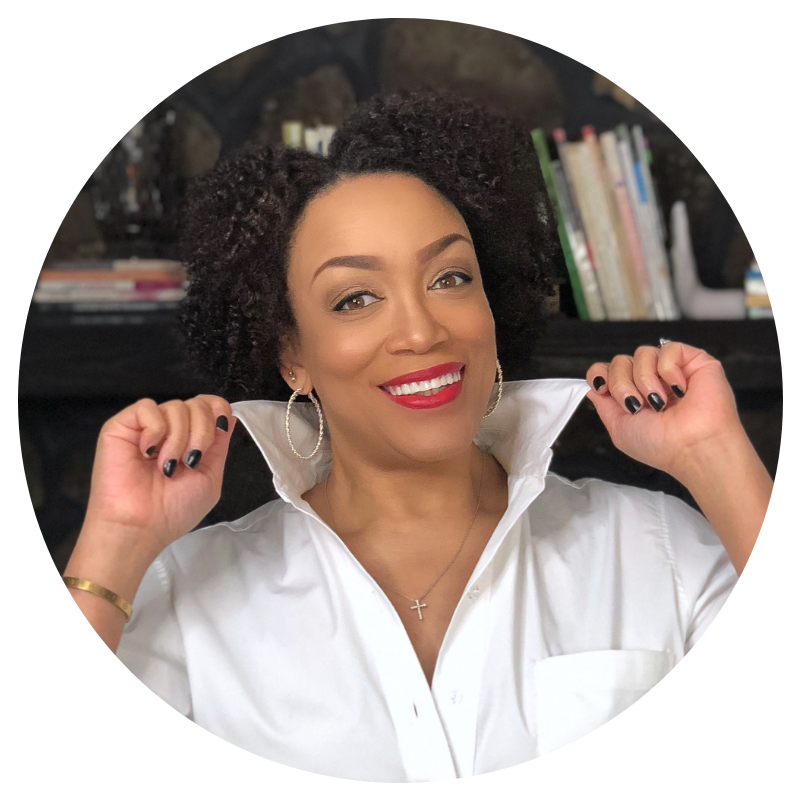 Michelle allowed us to select fabric cuts of our choice so that we all could create pieces that perfectly suited ours styles and personalities. 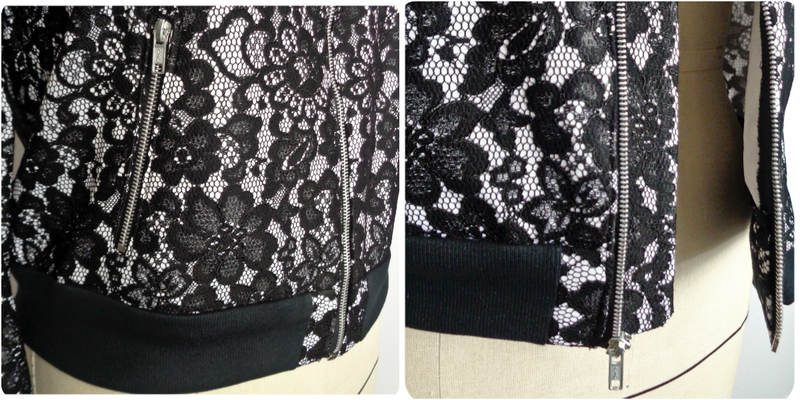 I picked this fabulous black lace that's fused over a white knit. 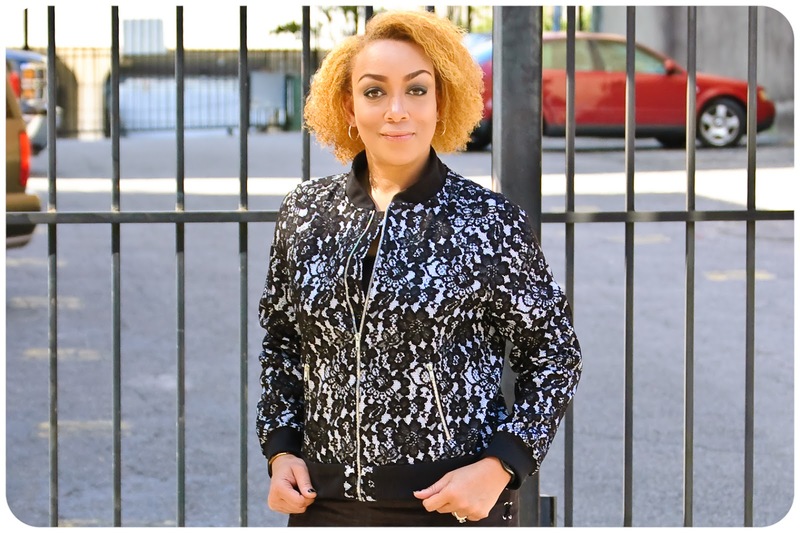 I decided to create one of this season's best jackets - a bomber jacket. I picked Burda Style 7210 (can't find it on the site). I made this jacket 3 years ago and I've literally worn it to death ever since. I reached this particular pattern because I absolutely love the lines, the various characteristics such as the slanted welt zipper pockets and of course I had it already sized and cut out. 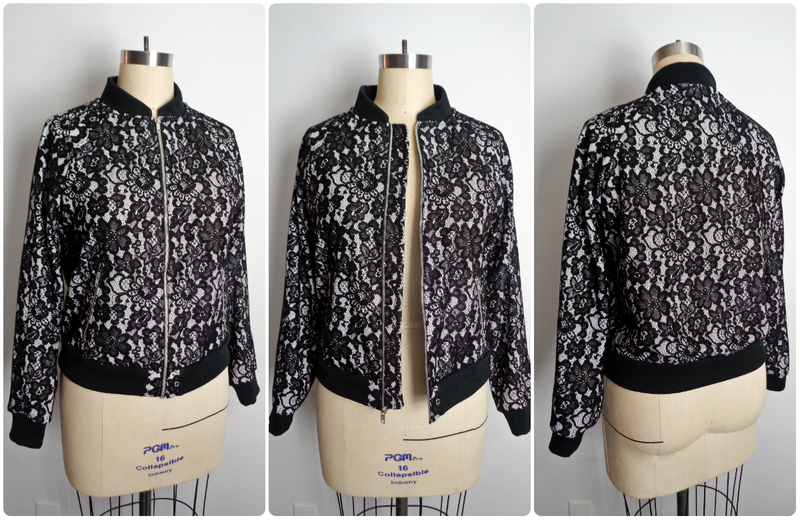 Since the lace is fused on a bright white knit, I left the jacket unlined and finished the inside with a lovely Hong Kong finish. With the lace being fused onto the knit, I had to be particular with what type of needle to use because this fabric has a lot of structure. I initially started out with a Ballpoint, which didn't work at all. 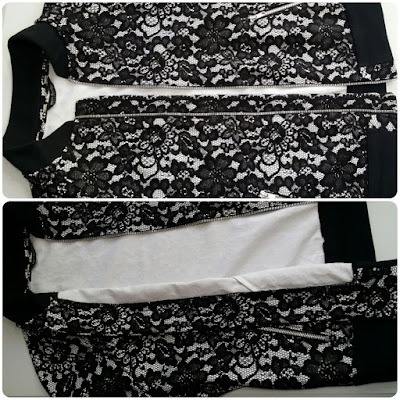 This fabric sews like a neoprene. So I switched over to a Microtex. And it worked perfectly. I wanted to give my jacket a mid-strip. 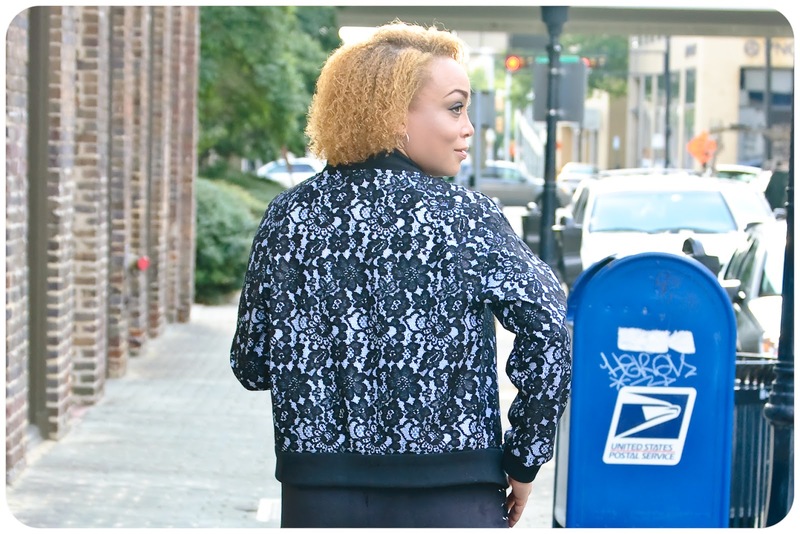 It's that piece that you see in RTW bomber jackets that's sewn on one side behind the zipper. It's similar a fly shield in pants. 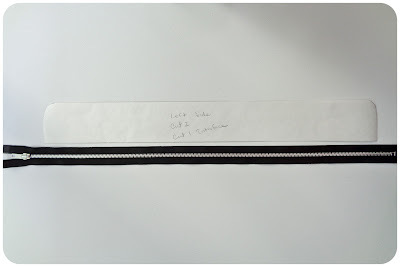 I drafted my own by measuring the length of the front edge of the jacket front, from the neck (minus the 5/8" seam allowance) to the fold line at the waist. My width is 3". 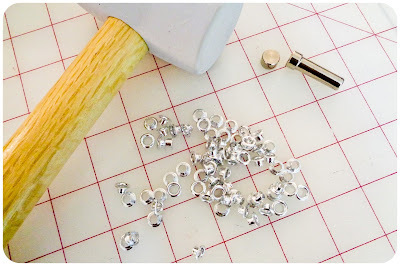 I cut 2 of these and interfaced one of the pieces. Here is how it looks front and back after it was finished. And I picked up my zippers (22" metal zipper and 2 - 7" metal zippers for the pockets) and rib knit from Joann's. 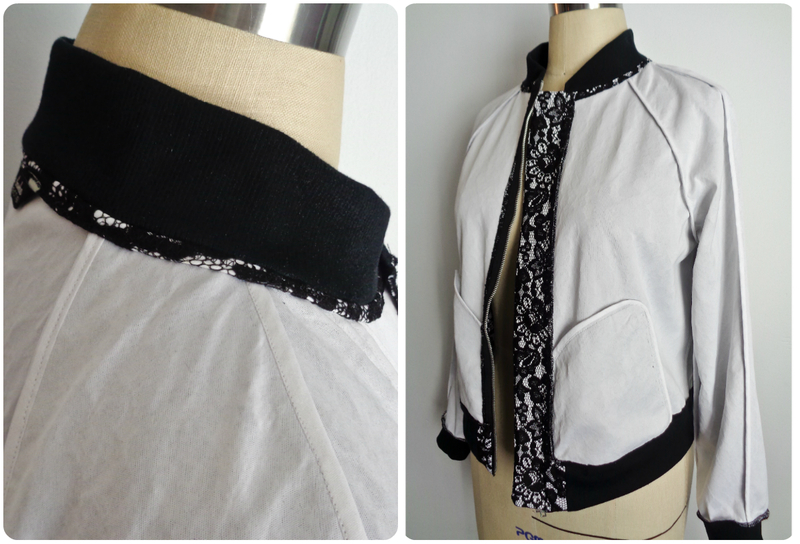 I love this fabric and I have a little bit leftover that I plan to use again. 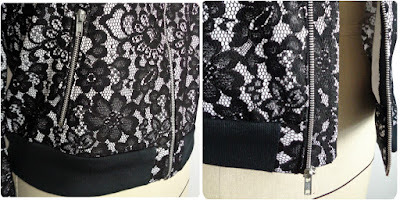 But here's something you need to know: even though this is a lace over a knit, it has almost no stretch. So I would definitely treat this as a woven. My second piece of fabric is this luxurious faux black suede. I've worked with genuine suede and I've worked with faux suede. I made this great faux suede skirt last year and I'm dying to pull it back out. So I'm accustomed to working with this type of fabric with positive results. And I've also worked with some faux suede before that left me sad because it was too structured and was probably meant for upholstery instead of being a fashion fabric. So I know what I look for in a good quality fashion faux suede. And this is a great fabric. I wanted a suede skirt, but one that was interesting -- appealing to look at. I didn't want a back pencil skirt or an a-line. So I picked this New Look 6418. I love the seam details of this pattern. It's the same lines that you would find in suede and leather in RTW. So if you're actually thinking of using genuine hides, this pattern is already cut out and ready to go. I cut the size 16. I generally go up a size in New Look patterns than I would normally cut in Big Four. I find that New Look patterns run about a size smaller and have less ease than the others. This skirt is noticeably similar to the white skirt I just recently made. The white skirt is completely self-lined. 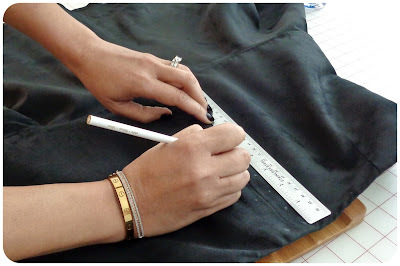 The New Look skirt is unlined. So for the top portion of the skirt, I flatlined it with a flannel back satin that I had in my stash. Flatlining is slightly different than underlining. I plan to do this again so, so I'll give an indepth tutorial on how to do this. I zhooshed up my skirt, because that's just the kinda gal I am! I wanted mine to be ornate and not just basic. I started out by adding eyelets to each side. I made my markings on both sides of the side seam lines. And used a mallet and the eyelet tools. 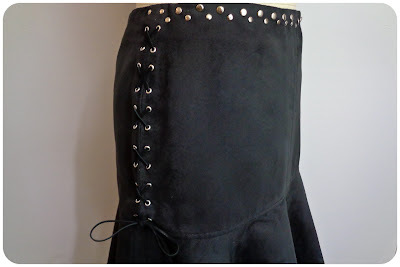 For the top, I used rivets that were left over from my chocolate leather skinny jeans because those eyelets were not going through all of those layers of fabric. 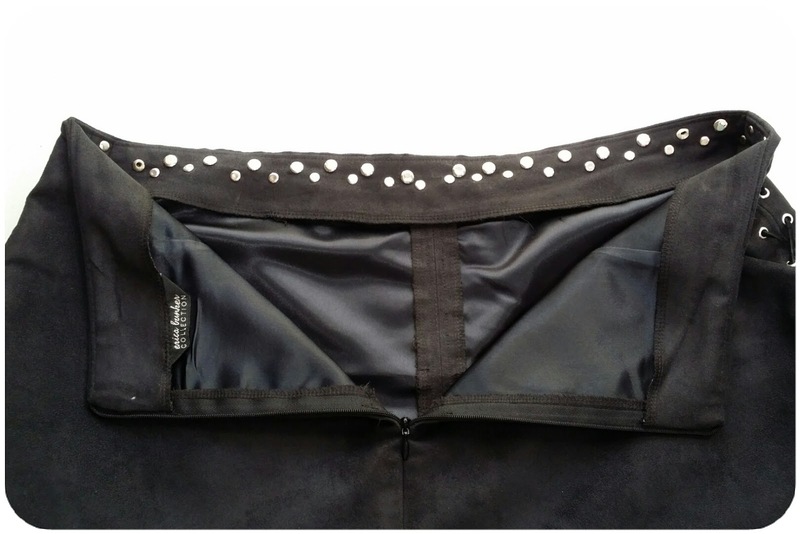 I was on a roll, so I continued the multi-sized rivets across the front. And I laced the sides with suede lacing found in Joanns in the leather/suede section. So, these were two great fabrics and I have to thank Michelle for including me in on this tour! Don't forget to check out Helena's project tomorrow on the next stop of the tour! 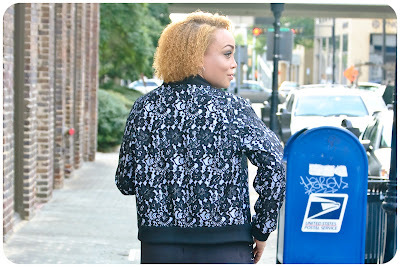 What a wonderful take on the bomber jacket! 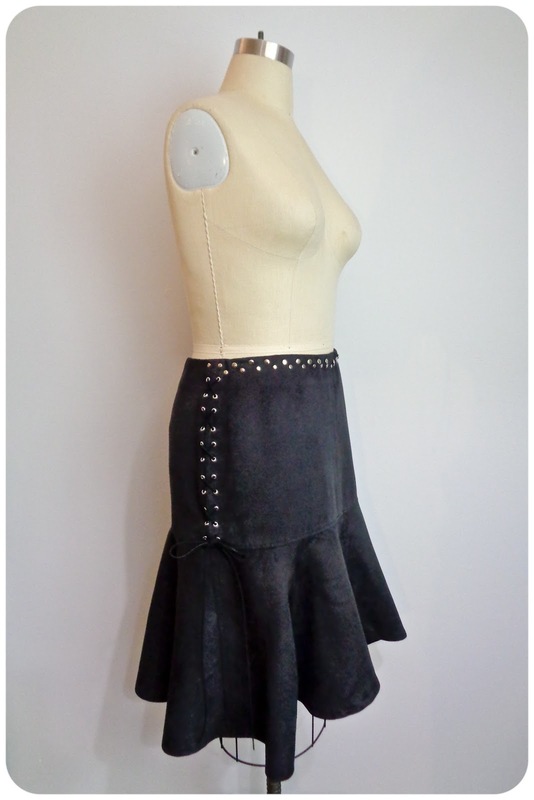 Love your choice and it's fantastic with the faux suede skirt! Just goes to show you learn something everyday. Flatlining? I had never heard of this outside of a hospital. Looking forward to the tutorial! It's just a combined way of lining and underlining. Thanks Angela! Very pretty outfit! I am looking foward to learning what flat lining is! Absolutely beautiful work, Erica! You are so GOOD at your craft! Just amazing! I love your jacket. Do you remember what size jacket you made? I made the size 14. Thanks Charlene! I love your jacket. I must add a mid- strip to mine. Yours looks just like RTW. You are the queen of outerwear, you can do no wrong. Thank you so much Re! 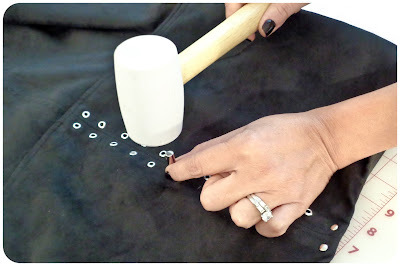 OMG, Erica you are such a sewing rock star! The jacket is awesome - I would never have the guts to tackle such difficult fabric - but now I'm going to give it a try, because that jacket is the BOMB!! 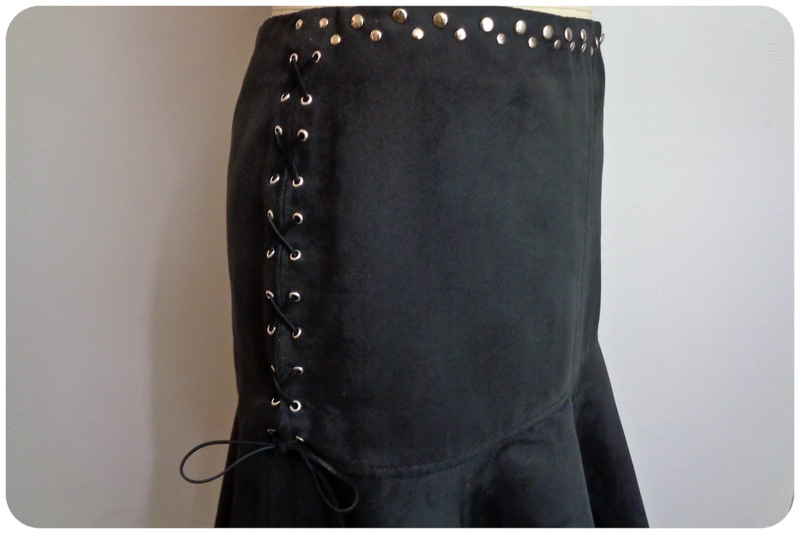 And the rivets on the skirt totally make the skirt. You are so inspirational, I just love your "sewing guts". Going to pull out my dressform that is sitting in the box in the garage, and get it set up, and actually use it, so I can better fit patterns to me. Keep up the great inspiration!! Once you figure out what you're working with, it sewed pretty well. Thanks Patty! LOVE your skirt! The details are really spectacular and unique. LOVE this look! Great job as usual!! I'm sure this will be a favorite! Thanks Candice! You've got to love a hobby that demands use of both precision machinery and a heavy-duty hammer, on the same project. Yes! Isn't it wonderful? Thanks LinB! I LOVE that skirt! And I love how all of your creations have that Erica B swag!!! The boots, the jacket, the skirt, and the whole styling is so on point. I'm lovin' these boots! Are they over the knees? What brand are they? I am also 5'9" so I'm always looking for things that fit us taller gals. Thanks Karen! They're OTK and from http://www.publicdesire.com/us/long-boots. Thank you, Erica! Had never heard of Public Desire. Cute shoes. Holy Crap. This is INCREDIBLE. I love this jacket so much. It took me a week to remember that this isn't my personal style and I shouldn't copy every single detail. I LOVE it on you. Love the outfit, and thank you for the information about the mid-strip! Didn't know that is what it is called :) I am curious, when attaching the mid strip, do you attach it after the zipper is installed, or before? It's sewn on after. Thanks Linnea!